Honoring Women’s History Month we start off the nominations you submitted over the past few weeks of women making changes in our communities not only in the Arts but also community outreach and political voices. These women are reshaping how society views the importance of their roles as courageous, creative and inspiring individuals. Viva La Mujer! Cindy Crystal Gonzalez is a political activist, university student and most importantly a mother of four striving for a better future for our children and our communities. Her mission in life as an advocate for women’s rights as well as immigration reform, co-founder of the Trail for Humanity as well as being an active member of grassroots organization PODER. (People Organized for the Defense and Equal Rights of Santa Barbara) has placed her on this list of empowering Mujeres making Herstory heard. The Trail for Humanity began on July 22, 2014 in the San Francisco Area to its final destination at the U.S. Mexican border, which consisted of women and children with a goal to walk 300 miles on foot with its sole purpose to bring attention to immigration reform, racism as well as protecting children from being incarcerated and taken away from their parents. I had the privilege to see the development of this protest make its way all the way to the U.S. Mexican border via social medias and I must say, Cindy is such a strong woman filled with passion and empathy for her Raza. It is easy to discuss political issues and debate on what should be done in our communities in order to protect the future of our children. But it takes greater courage to actually take into action what needs to be done. I have always said that we need more leaders, more organizers, more people to take a stand for what’s right. And for a woman, a mother, a fellow student to take matters into her own hands and organize other women and children to march for humanity; it is inspiring and gives us all hope for a better future! 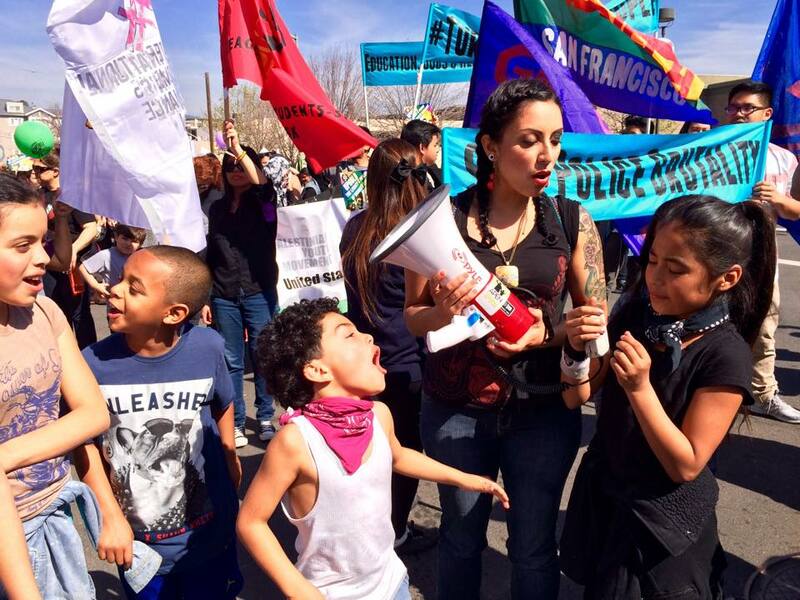 Cindy Crystal Gonzalez leads by example, protesting, organizing the masses as well as leading the younger generation. Teaching them the importance of fighting for human rights as well as acknowledging that their voices can and will be heard. Here is the latest demonstration she was a part of for Womyn’s International Day on March 8, 2015. I love the fact that she involved the children in all she does. She is a leader and an amazing role model. I am thankful to know her and see her love and passion for humanity, our Xicanas and most importantly our younger generation of organizers growing stronger with every step she takes. You have a long triumphal journey ahead you Cindy, we are all rooting for you! Hello! I could have sworn I’ve been to your blog before but after going through many of the posts I realized it’s new to me. intelligently about. Now i’m very happy I found this during my search for something regarding this.